One thing I’ve learned while running this website is that love can be very diverse, dynamic, and even controversial, and to add to that there are so many different perspectives to everything. Please hear out this story by Left. And let us know what you think! Thank you. 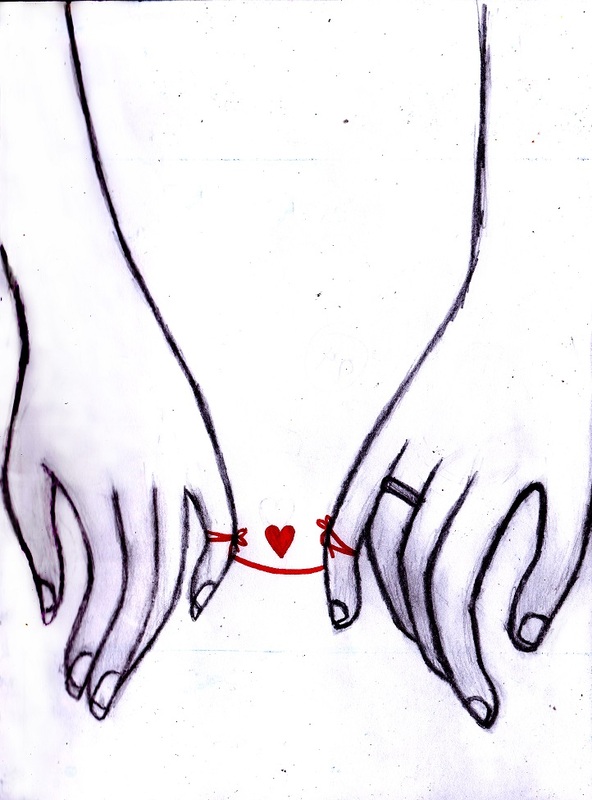 We call ourselves “Left” and “Right” (I’m Left) because we are opposite sides of a long red string attached to our pinky fingers… and our story begins in a couple messages via Whatsapp… messages later I told a complete stranger my darkest, deeper secrets and he loved it, not only that he shared some dark secrets from him self too. We are both “happily married” with kids, but we are not leaving our family, we love our spouses to the end of the world, but, we also love each other deeply, sincerely… like we have never loved any other human being in our entire lives. Because of this, we are keeping a secret journal, open to the internet, but private to our families, I have hunch that things are gonna get very dramatic at some point, and that’s one of the reasons I keep the journal, to see when I starts. Anyways, I write to let you know that is it indeed possible, to fall in love with two people at the same time, to love them, but the love you can have for each one is different, I promise. This is just from my little knowledge that I share. All the best. Another one who has no idea what kind of drama she is headed for. So much more common than we realize. Best of luck! I would love to follow her story to see if it turns out any different than others I have read about. Can you post the blog address? Maybe it is possible to love more than one person at once. I don’t believe however, you can love them both on the same level of deepness. In a marriage, the two become one and if you love truly yourself, you will also love your spouse enough to consider how they may feel if they found out. I wish you the best left but follow your true heart and do right by right. Of course a woman can be completely in love with two people at once. Love is infinite. Whatever I give to one person does NOT take away from someone’s portion. However, Left is asking for trouble! I thought about something similar when talking to a friend a few weeks ago. Sometimes I think that the English Language is sometimes limited in our vocabulary. Love is one of those words that seems like there should be multiple variations, but in English we only use the one word Love. I’m not in your situation so I can’t comment directly, in the end you’ll have to do what’s right for YOU. I read another blog, and wrote about something similar, this one was about male sexuality. Although it’s on a different topic, I think there are a few parallels here worth considering. The author of the blog talked about how men are attracted to women or aroused by them sexually. He talked about the myth that we’ve been taught, that you always have to “do something” if you’re attracted to someone, i.e think that you should be in some type of relationship. Sometimes we’re attracted to people, but we don’t have to ALWAYS act on it. Basically what I’m saying is that I think that we can feel a deep connection with someone, although it might also be sexual, we don’t have to act on it. I think it’s possible to be close to someone, and share many things, but never be sexual. As I said before I don’t know you or your story personally, but I do wonder where you fall along that continuum! Be careful with your heart! If you are seeking out other close relationships then there is something lacking and if you are having to hide “right” there is something wrong. It is so possible to love two, but it is also to end up in a heartbreaking and sad situation that doesn’t only hurt you, but the ones you love. I wish you ALL the best and thank you for sharing this so openly. I do caution you to seek out what you are truly lacking and trying to fill. I´ll agree with you on this, that there are different levels of love, different types of love. But as a commentator said, the last one before I post this “sharliebrown” I to tend to agree with her. But best of luck to you. Hi people, thank you all for all your comments, if you need to know more details, you can visit my blog, this story is 100% real and I understand that some of you cannot understand most of what is going on between us, but you are always welcome to comment and read our story. I have come to this late sorry. There are so many ways to love. The Internet is a new channel for strangers to meet and fall in love. It secret, exciting and intense. When communicating of on line it is intense emotions and are not diluted by life. Also it’s easy to show ones best qualities on line and hide some of one’s worst. We see the person ,we get drawn into their lives and our brains fill in the gaps about the person that we don’t actually get given. Therefore that Internet lover becomes the perfect soul mate. Whether it would actually be like that in real life is a different thing. Living with moods, habits, quirks and behaviour not exhibited on the net might lead to a whole new scenario. Reb logged on my site.